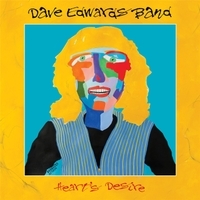 DAVE EDWARDS BAND first rock n roll full length since 2009! Heart's Desire is Dave's first full length rock record since 2009's Lone Survivor. Produced by Bob Monteleone (who also plays every instrument under the sun on this one - including drums) and mastered by Grammy Nominated Tony Lake - has Dave's fired up core band (Jim Megerian, Rusty Russum & Jason Van Doorn) on many of the new tracks which gives this disc a "live in the basement" feel that is funky and engaging. Heart's Desire features 11 songs Dave has always wanted to record. Cover painting is by the iconic Detroit, MI drummer/artist Johnny Bee Badanjek. There are rock n roll barn burners, country flavor tracks, pop and a stunning take on John Hiatt's "Angel Eyes"
that is probably the most emotional vocal that Dave has ever done. We are very proud of Heart's Desire and hope you love it. so here we are 10 years down the road surrounded by good friends, great family, God, love and light.